“Lesbians are not women.” This (in)famous statement by renowned theorist, writer, and activist Monique Wittig marked a watershed moment in critical understandings of gender and sexuality. Wittig’s mise en question of the notion of “woman”—a term she argued was necessarily enmeshed in heterosexual and patriarchal systems of knowing—unsettled seemingly self-evident relationships between language and reality, signification and subjectivity, and even, if not especially, women and feminism. 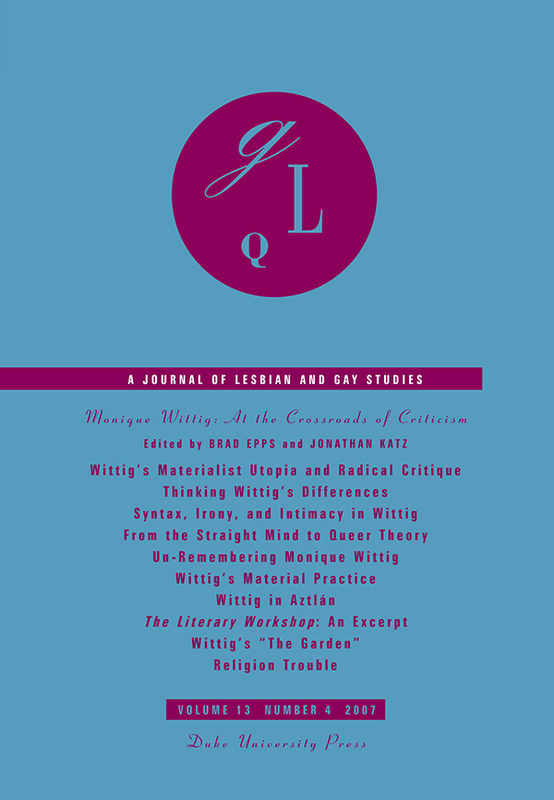 Recalling Wittig’s project and practice of lexical disidentification, by which gender and other signs of identity are ruptured and reworked, this special issue of GLQ offers a variety of often conflicting views on Wittig’s aesthetic, political, and theoretical work. Contributors provide critical and disparate snapshots—some more theoretical and abstract, some more experiential and concrete—of debates on, and investments in, Wittig’s theoretical legacy. Judith Butler analyzes Wittig’s “particular” universalism and offers a careful exposition of her worldview. Diane Griffin Crowder studies Wittig within a context of materialist inquiry that has often been ignored or misunderstood. Robyn Wiegman examines the complex nature of memorialization and inquires into Wittig’s place in contemporary queer theory. Seth Clark Silberman, calling attention to Wittig’s fiction, reverses the usual ascendancy of critique over narrative fiction and produces a formally innovative, if willfully “parasitic,” account of Wittig’s claim on the contributor’s imagination as he watches his mother slowly die of cancer. 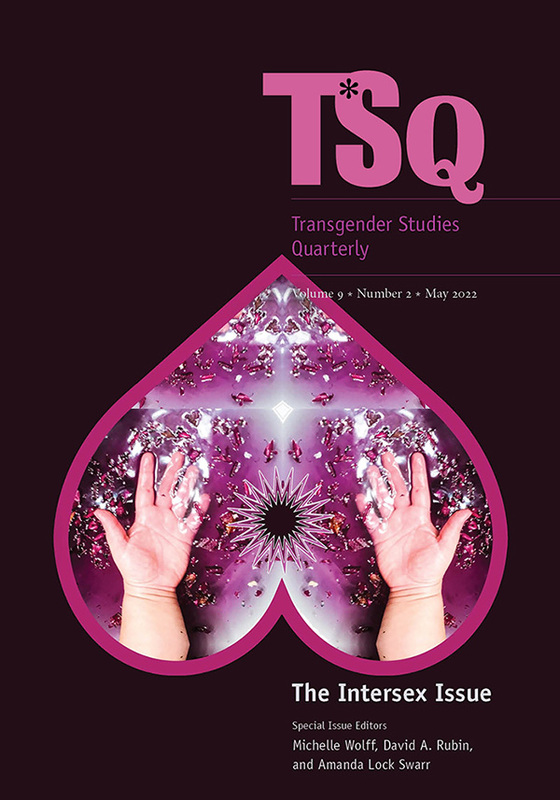 Alice Jardine, who situates Wittig as a disruptive and disorienting force in a mother-centered feminism, provides an autobiographically charged review of the recent history of feminism, queer studies, and the still uneasy relations between them. 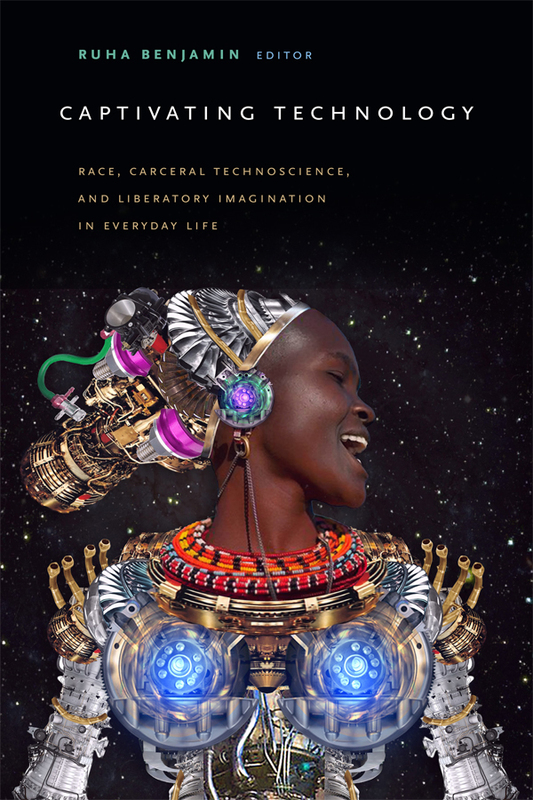 The issue also includes a detailed introduction by Brad Epps and Jonathan Katz; a brief personal reflection by Sandra K. Soto, a close friend and colleague of Wittig’s; and two texts by Wittig, one critical (with a foreword by Sande Zeig) and the other creative, both previously unavailable in English.